Brand Begins and Ends with Your Products (Or Services). The truth is that product is your best way to build brand. But this has been lost by the billion dollar brand consultancies and amidst the plethora of marketing PhD dissertations – with collusion from creative teams who learn the hard way that their best opportunity to get the NEXT ad job is to ignore product in THIS one. Consider the brand ecosystem chart Forrester tweeted today. (Link here.) I challenge you to find product in this brand activity chart. Oh, yes. It’s there…somewhere…amidst all the complexity. Of course, history suggests that developers will probably blame Apple (lack of tools, communication, kickbacks, so forth). So I’m ready for it. But I doubt it (having worked briefly at a developer and watched the developer battles since the early 1990’s). In fact, my first software development project was in 1982. And I’ve watched software progress with tremendous interest since. The mistakes I’m seeing are mistakes of an immature industry. Here we are. Just two weeks short of 1 year since I received Flatland. And what finally shows up? Flatland 2. Have to admit that the full blown wide-eyed amazement has worn off. Because this is “merely” an upgrade and no longer a step into an entirely new world. But let me get back to “better cover”. At the risk of making a positive mountain out of a reaonable molehill, I LOVE this new case, form factor. It’s simply…well…it hurts me to do this…but it is actually kind of magical. What did I buy? 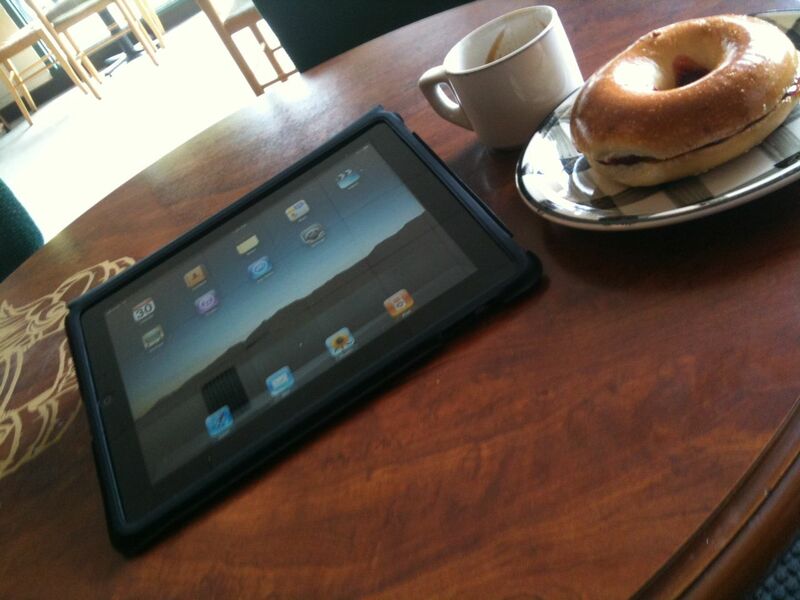 iPad 2 with 3G (AT&T) and 64 GB. Upgraded memory – not because I every came close to using up my 32 on Flatland 1. Rather, I believe in buying the higher end for resale and because software starts expanding to use more memory. My initial experience. Absolutely what you want. I took it out of the box & plugged it into my computer. It downloaded new software and restored my entire Flatland world from backup. And, I was off and running. Took about 20 minutes total. – Internet is clearly faster and stronger. Pages load more quickly, switch more quickly. – I find less restarting of applications when I re-open them. That means the multi-tasking is working better. May be the result of better iPad 2 design. It might also be an advantage of the 64Gb size. But even Angry Birds, which I’ve rarely had work well under multi-tasking, was staying in its same state when I navigate away and back. – The camera’s just seem, well, natural. I have an iPhone 4 so they’re not a surprise. But, it’s pretty cool to add. And, these will let me Skype and FaceTime from the road. Very nice. Did I Mention The Case? For something you handle all the time this is important. Ever notice how many people kept their iPhone 4’s without a case for way too long? That’s because they loved the product and didn’t want to cover it up. Yes, they were risking damage. But I regret that my iPhone 4 has to live in a case. So, too, with the iPad. For the iPad 1, I bought Apple’s case then started to search. Bought a case that was a portfolio and traveled a bit with it. Not very helpful, made it really bulky, lacked precision for standing it up, and it was a pain to remove my iPad to work in the keyboard dock. Then, I bought a second case – it was so bad I never really tried to use it. My year with Flatland 1 was spent with Apple’s case. And, it really was superb – no vendor could compete. This time I decided Apple probably had a great idea. And they do. This one is is outstanding. The screen needs protection and this case protects it. Otherwise, it’s just me and Flatland 2 – the case stays out of the way. And, when it’s rolled for support – it seems stronger than Apples case for the iPad 1. In other words, I really get to enjoy the slim wonder that is the iPad 2. Final Words? App Developers are the Tablet Weak Point. My lingering disappointment in Flatland isn’t with Apple. It’s with the App developers. Fundamentally, App developers are proving to be a pretty thick headed group. The Apps (a) refuse to use the advantages of the pad and/or (b) abuse the screen by wasting it on “white space” when it should be used productively. – Why don’t Apps like CBS Sports, Bloomberg, and many more have indicators to tell you when you’ve selected something? This is a user interface basic! Very fundamental. I could go on and on. It’s possible that these are Android weaknesses and that these developers are making things for lowest common denominator (Android). The Apps feel like they’ve been build with the hamfisted approach of many PC applications. If so, they are making a mistake. The apps which really utilize the tablet are the ones that get bought most often – unless you have no choice. And So… I head into the new world, powered by a more powerful Flatland. The only question is…what adventures lie ahead? Should Apple Share its Software? It’s interesting to see discussion that criticizes Apple for not releasing their software. Now I’m in no way a ShareWare/FreeWare expert. But some of the fallacies surrounding FreeWare seem pretty obvious. One: There’s an implication that “Microsoft succeeded because it shared its code.” Really? It did? I don’t think so. If I remember right, Microsoft is paid for every unit that is sold with it’s proprietary operating system. What makes. Microsoft different from Apple is that it is primarily a software company where Apple is a systems company. So you would expect Microsoft to seek to put its software everywhere. Two: “Offering your software to other people is the road to business success – profitability.” Let’s ask Sun Microsystems about how much profit they got from Java. Although Java penetrated the market thoroughly, it didn’t generate a big enough bottom line advantage for Sun to save the company. Three: “What about Unix?” I love Unix and used to use it quite a lot. But you can’t compare Apple’s IOS with Unix. No one needed to profit from Unix because it came out of a government and university funded effort. Why don’t we check with Apple’s CFO to see if they’ve become government funded? Four: “What about Android?” Now we arrive at the newest test of the theory that a public company’s best interest is maintained by publishing FreeWare (or ShareWare). Truth is, we can’t say how it’s going to turn out – Android is too new. But don’t confuse a plethora of Android handsets with success. Google’s ultimate win must include generating higher ad revenue because it published Android. So, maybe tech’s fascination with sharing got its start with scientific collegiality. More often I think it’s based on some ill considered utopian ideals. Personally, I hope Apple doesn’t share. Love them or hate them, when you buy something with Apple software, you know exactly how it will work: the way Apple intended. And that’s what builds a strong brand and strong profits. Did Apple turn tech marketing on its head with the iPad? The marketing world is guided by theories – “models” that are expected to explain the key issues we face and help us take action. Without these models, marketing would grind to a halt. Too often, though, we forget that these marketing theories and models lack the strength of true scientific theories. Scientific theories aren’t accepted unless they can be replicated under controlled circumstances. But in business, there are no controlled circumstances. So marketing theories try to make sense of behavior we’ve observed, but lack the strength and repeatability of science. How did Apple pull this off? First, I doubt that they thought a lot about it. People who change the rules do so because they’re entirely focused on their vision of the end result – not on the idea that they’re changing things. Second, it appears that a small team at Apple shared a very powerful vision of how mass market consumers would use the iPad and drove product development to satisfy that core audience. Apple understands that to continue to generate revenue from consumers, products need to be more refined. Third, Apple demanded that technology rise to the quality of a consumer good. This is most publicly evident in the statements that have gotten them in hot water with the industry. Apple refuses to support Flash because it degrades the quality of their end users experience. Apple controls the types of Apps approved for their store in order to, again, provide a good user experience. They’ve been pilloried in the press for these choices, but they make the iPad a damn fine product. Fourth, the iPhone had pre-trained the market to use the iPad successfully. Anyone with iPhone experience can pick up an iPad and be quite capable in a very short time. As I consider what Apple’s done, it makes me think the traditional model may have been wrong all along – and even been a problem for the industry. Why? Because success with classic early adopters requires a focus on gee-whiz gadgetry. That causes products to be harder to use and may even lead companies into failure with designs that are impossible to change to satisfy mass market requirements. So should we all now reject the older model? Absolutely not. In any set of circumstances one model or another will be most useful. Marketing wisdom is fundamentally the ability recognize the uniqueness in your situation. But to follow Apple’s success, most companies will need to learn new skills in order to develop a clear vision of the mass market product and make certain that product development delivers that vision in the first release. Now back to my premise. Did Apple succeed without early adopters? Of course not. But they dramatically changed the typology of the early adopter – reaching a much broader market than tech has traditionally reached. The exciting news for all of us is that their successful approach leads to much larger successes. We simple citizens expect that major news organizations work hard to find the truth about topics. And we expect they won’t pass along mis-information coming from competitor’s attack machines. But it doesn’t work that way. In politics, Clinton’s 1992 team found that the first story to be filed almost always established the one “storyline” coming out of a speech. The rest of the press would repeat that storyline – no matter what else important Clinton might have said – thus creating the surprisingly bland range of topics covered by news outlets. This press laziness is the only thing I can find to explain the miserably poor coverage of iPad “input”. Following the Apple announcement, pundits formed a theme that “there’s no input to the iPad”. And that theme appears in nearly every article about the iPad. …The on-screen keyboard is far better than the frivolously shallow news reports would suggest. 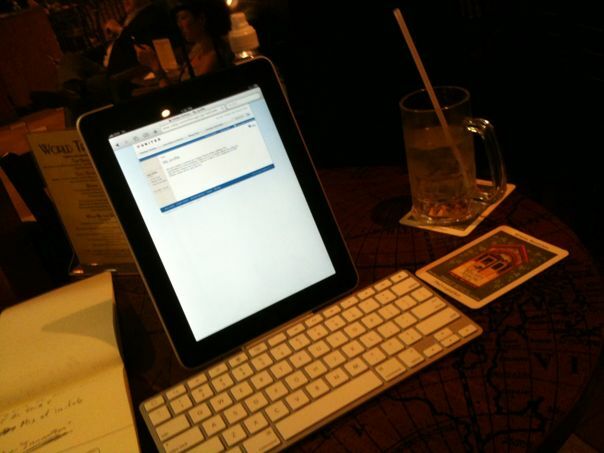 …Using a full size keyboard (dock or Bluetooth) is so effective you can write books on the iPad. …There are many options for getting files to and from the iPad (email, iTunes, FTP, document sites, etc…). Whats unusual is the approach to files. Apple turned files on their head. On a desktop or laptop, we seek out the file to open the application. On the iPad, the application keeps track of the files. So we open the App in order to get to our files. Why? I don’t know – they didn’t consult me. But this shift delivers simplicity. Files don’t only live in the app. They get to the iPad through an iTunes file cache, through email, or downloaded from the web. From that point, they live in the app. The lack of a USB port seems to confuse techies. My guess is that adding a USB would add an entire level of complex structures to make files independent of programs. Not a good trade off when you already have simpler options. Fortunately, the storyline hasn’t caused a problem for Apple yet (they’ve sold plenty). But I still think Apple should confront the issue. And, Apple should work with press outlets to get the story right. They’re leaving an information void on the topic. Information voids usually fill with damaging information. Lacking an Apple response, their competitors are using the press to great advantage. Bill Gate’s comments on the iPad last week brilliantly capitalized on this storyline. And with the predictability of cattle returning to the barn, the wire stories about Gate’s comments picked up his erroneous comments unchallenged. Sadly, though, the technology press only rarely suffers for being wrong.